Home » Misc.Paper » Die Cuts Victorian Etc. 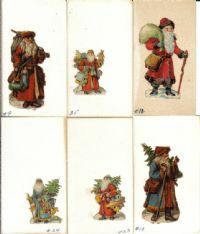 Here is a super set of early Victorian Die Cuts featuring images of old Santas !!! These have been hand cust many years ago and mounted on the back of business cards. 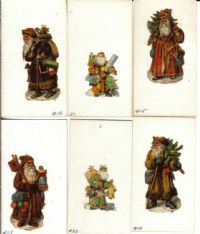 Each features a different Santa, and show how he changed through the ages. Included are red robed, blue robed, brown robe and green robe Santas! Each measures approx. 2" tall or so. Back of business cards advertise a doll shop in Bloomfiled NJ. Condition is very good on all. All sold as one lot! #341 3 Black Memorabilia Die Cuts ! These are super! Each is an original Victorian Era die cut. They came from an old Victorian scrap book. Included is a 6" diecut of fancy dressed black man riding an ostrich, 4" black boy with flowers and 4" black minstrel playing banjo with top hat. All are in fair to good condition as shown. A nice lot of black memorabilia at a super price!